Check your email for a link to enter your name in the lottery. 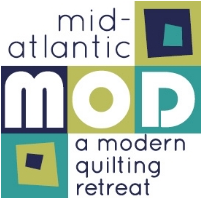 Quite a few members have expressed a desire to attend MidAtlantic MOD next May, and so we have paid to once again be sponsors, ensuring 10 spots for NJMQG members. Once the early registration period is over, there will be a limited number of additional spots available to the public on a first come first served basis. We have agreed to hold a lottery within the guild for the 10 spots allotted to us. If you would like to go, and are able to pay the full cost of registration, please check your email for the link to the signup form. On Monday November 5 we will draw 10 names and those people will be guaranteed spots at MOD. Registration: Sunday November 11, 7 pm. 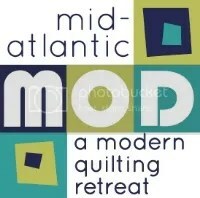 The NJMQG is an official Mid Atlantic MOD sponsor again this year! This retreat is planned by Central Jersey MQG and the Philadelphia MQG with surrounding guilds also participating. It’s a fantastic retreat filled with SO much to do! Being a sponsor for the retreat guarantees our guild first access to 10 spots during early registration and a $25/person discount for our members that attend. * Early Registration begins this Sunday, November 13th at 6pm and will be available only until November 26th. It’s first come, first served! Here is the registration info you have been waiting for! WOO HOO!! Thursday, April 27-30, 2017 at the Doubletree by Hilton in Lancaster, PA. It’s a beautiful hotel in a great location! Workshops: $15 each. Click here for list of workshops. Page will be finalized with photos soon. You can choose to take workshops or not. Lodging: Room rate is TBD + tax per night for single or double occupancy (last year it was $124/night + tax per night for single or double occupancy). We will update here on the blog when we have the info or check the MOD site. General registration for very limited spots will open to the public in late November. NJMQG members will still pay the discounted price. Non-Member cost: $155. Some attendees chose not to participate in any of those options and sewed to their heart’s content (some people even sewed in their pjs). If you are on Instagram, check out the hashtag #midatlanticmod to see what everyone was up to at the last retreat! Click here for more info. Diane F. will also be at the meeting Thursday night to answer any questions. The MQG has many opportunities going on right now! They are writing a book and asking for submissions, looking for Quilt of the Month designers, Block of the Month designers, QuiltCon Magazine submissions, Michael Miller Challenge entries, Nine-Patch Challenge entries, QuiltCon Entries, Faculty for MQG Webinars, QuiltCon 2018 Teachers and Lecturers. Click here for more information and deadlines.